Call our expert glaziers in Birmingham and Solihull for a first class glazing service. 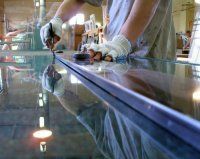 Whether you need replacement double glazed units, commercial scale glass repair, glass table tops or mirrors cut to size, our team of experts have the skills and the tools you need. Based in the Stechford area of Birmingham, we provide an efficient, high quality service to clients from across the West Midlands. We are an established and respected team with many clients who return to us time and time again. For replacement double glazed units in Solihull, call our team for a free quote. We are proud of the quality of our workmanship and the durability of all of our double glazing. We work swiftly to meet any order and we work hard to keep our prices competitive. Please visit our main website, as listed above, for more details. So call us today to discuss your glazing needs. You can reach us on 01217 833 455 or e-mail us at stetchfordglass@btconnect.com. Our friendly team are always happy to help and we welcome requests from clients across the Midlands. When you need glass repair in Birmingham or beyond, make us your first choice.